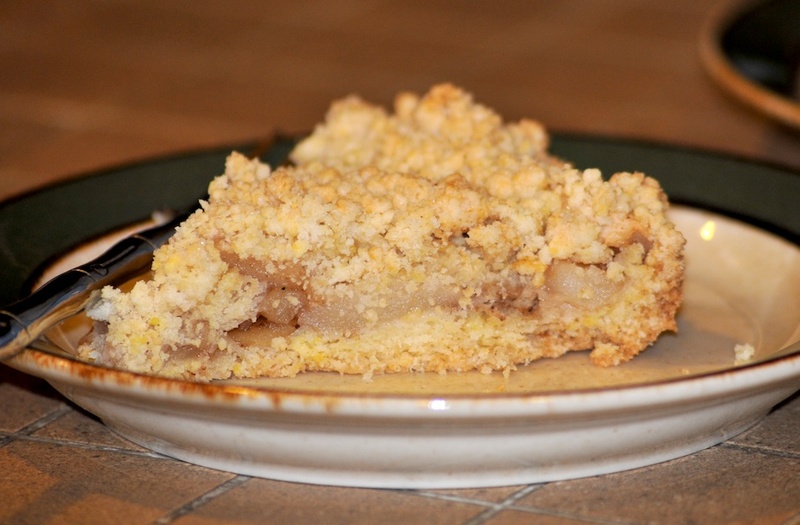 German Apple Streusel cake or Apple Crumble Cakes are awesome. In German we call crumbles "Streusel", it is a great topping for any fruit cake. The most traditional cake might be the apple cake with Streusel. This recipe is using marzipan as well. Happy Baking! - Whisk softened butter until foamy, while whisking add vanilla sugar or vanilla bean. - Add one egg after the other and whisk until creamy. - Mix flour, starch and baking powder and with milk (alternating) add to dough. - Spread dough on a greased deep baking tray. - Peel apples and cut in small slices. - Sprinkle apples with lemon juice so they won't get brown. You might need less or some more apples depending on how you place them on the dough. - Cut marzipan in little cubes. - Add flour, sugar, cinnamon and egg yolk into a bowl. - Add butter in little flakes on top and with your hands create small crumbles. - Mix marzipan cubes to the crumbles and spread them over the apples. - Pre-heat oven and bake the cake for about 35 minutes for 200 C or 390 F.
Let cool off; serve with powdered sugar on top and whipped cream. Use about 35 g less flour. This will add a nice light yellow color to the cake.